Volvo is on a roll and has upped the anti with its latest bit of stuntvertising. 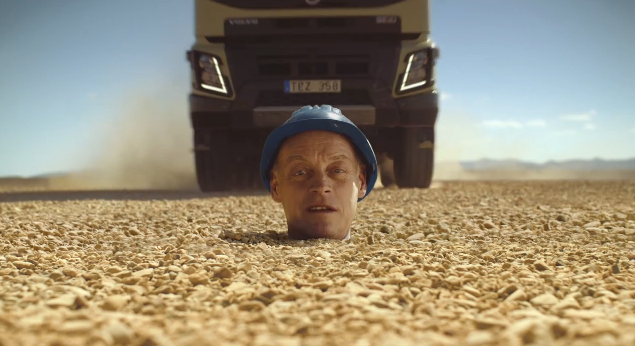 This latest stunt, which follows Volvo President Claes Nilsson standing atop a 32 ton truck suspended by a crane and a hamster driving a Volvo truck up a cliffside road, has Volvo technician Roland Svensson buried up to his head. As he calmly shares the fact he's been working on the high ground clearance suspension system of the new Volvo FMX truck, the FMX truck, which has 12 inches of ground clearance, speeds right over Svensson's head which, we are told, stood 10 inches above the ground.